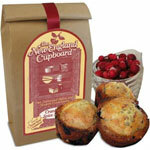 Produces light and flaky biscuits that are created with Maine-made Bakewell Cream. A great addition to any meal, serve these biscuits with butter, honey or your favorite jam - and don't forget strawberry shortcakes. Yields 8-10 mouthwatering biscuits. All natural, no preservatives. Net weight 12 ounces. Ingredients: Unbleached Wheat Flour, Bakewell Cream, Baking Soda, Salt. Manufactured in a nut-free facility.